Happy New Year of the Pig! Since our last newsletter, we have launched testnet.harmony.one with secure randomness and robust peer-to-peer networking. Whitepaper 2.0 is public and Mainnet 0.1 is getting staged. Close to 100 Foundational Nodes are committed to staking in Harmony. Partners are ready for Harmony as a data sharing platform. 200+ community members & 15 partners engaged us during our Asia Tour. Our new technical harmony.one/whitepaper is now public! Watch our technical talk or ETHDenver slides for the announcement. Our adaptive proof-of-stake (see the illustration below) prevents malicious nodes from overtaking a single shard. Join our development effort with Gitcoin bounties! We’re looking for contributions on improving our test pipeline and increasing test coverage. Our full team is also active on Discord and talk.harmony.one forum for your questions. Since launching our foundational node program, we have received strong community interest from more than 15 countries. These operators will help secure our network by running nodes and earning staking rewards. Blockchain in 2019 must not only scale but bring economic value to users. Harmony as a data sharing platform resonates the most with our partners. We solve the pain point of mutual distrust to share but strong desire to acquire data. Controlling your own data must be a basic human right. Harmony will disrupt the centralized models like credit rating agencies or ad exchanges. Range queries, such as Do you have a net worth of $1M or more? Are you interested in a job offer with $200k salary in a Fortune 100?, now enable customers and business to interact with limited privacy exposure. 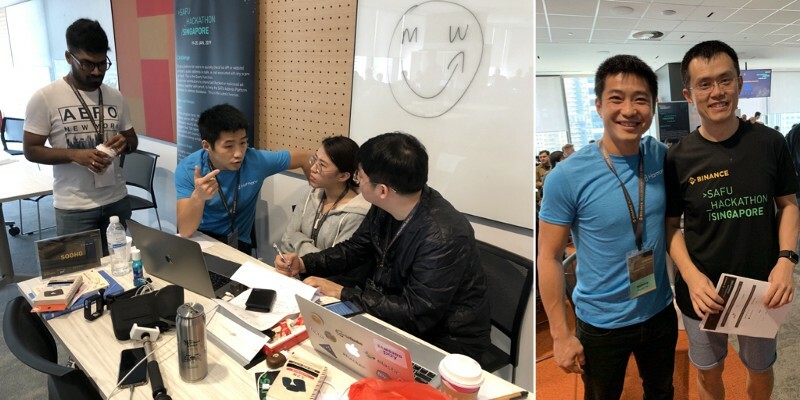 Mentoring at Binance Fair in Singapore (see the event pictures and @CZ’s tweet below) and touring in Jakarta, Vietnam and Hong Kong (see our tweets), we saw strong business understanding of blockchain uses. Our visits to (soon-to-be) unicorns Go-Jek, Traveloka, Investree, HARA, Kambria, Animoca, Flexport inspired us to an earlier launch of Harmony network. We summarized the lessons from the tour (Businesses are Ready; Launch Now!) at our TGI talk on Harmony Youtube channel. See the strength and welcoming spirit of the Harmony Asia community in our trip photos! Our engineers attended Stanford Blockchain Conference (the top research and technical event of the year) which our lead investor Lemniscapsponsored (see this insightful overview by Roderik van der Graaf). We spoke as a panelist at GSVlab’s Tokens and Beyond, along with CryptoWerk, NKN, InMusik, on business use-cases. Next week, we’re heading to Harvard Blockchain Summit to speak along with NEO, Bakkt and Oasis Labs. We completed two AMAs on Cryptocopia and Cent, responding to over 40 community questions. The top question is about our implementation of VRF+VDF (verifiable random function, verifiable delay function) with a dynamic adjustment of the security difficulty parameter. Our team is attending the full week of #BUIDLWeek Colorado and hosted a developer event (watch the full talk) at ETHDenver with NuCypher on scaling trust and privacy. Lastly, we need your help on bringing active users via partnerships. Build with us towards Harmony Mainnet!